Welcome to the latest in my series of One Bowl Suppers! If you are just tuning in to this channel now, the Southern husband and I are having a weekly one bowl supper that features a whole grain, a protein, some kind of greens, some kind of colorful veggie and a drizzle of dressing. We’ve experimented so far with steak, with seared tuna and with salmon, and this time we gave jarred tuna a go. And once again, experimenting with a completely made-up-at-the-drop-of-a-hat combo of flavors and ingredients didn’t let us down! One of the things I love about these meals aside from the crazy combinations and the meeting of whole grains and veggies and proteins is that each one of them so far has been a mixture of warm and cool ingredients. 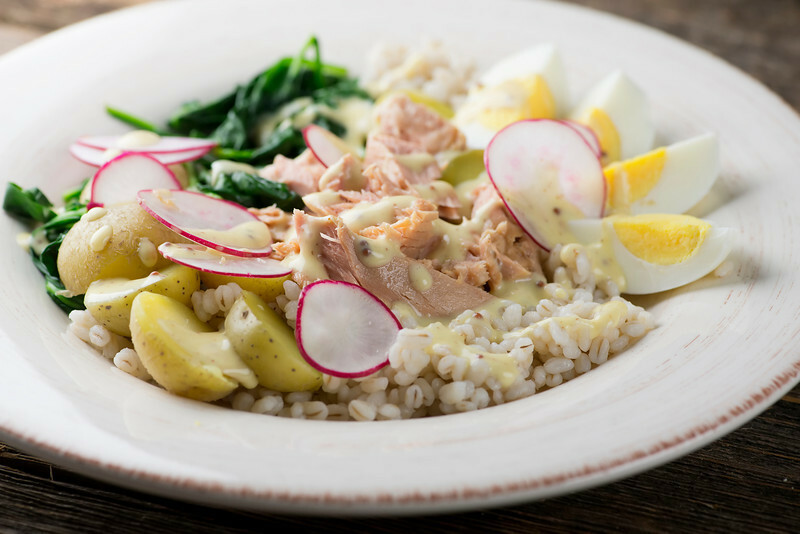 A bite of warm barley followed by room temperature tuna and cool radish…it keeps your tastebuds guessing. In a good way. Even though we had the part of the protein being played by the tuna, I had a couple of hardboiled eggs in the fridge, so they went on the plate too. The greens were quickly sauteed baby spinach, and the thin-sliced radishes added a little snap. So did the drizzle of honey mustard dressing. As usual, we tried to divide the plate evenly between the grains, the veggies and the protein, so that we had a little bit of everything in each bite once we got going. This week we are going to give shrimp a turn in the bowl, along with some snap peas and feta cheese and sliced apple and I’m not sure what else yet. It’s a One Bowl Adventure! Enjoy this one while I figure the next one out. Drain the tuna and break it apart with your fingers, leaving some large chunks. Set aside. Boil or steam the potatoes until they are tender, about 10 minutes. Cool slightly and cut into halves. Heat the olive oil in a large deep skillet and saute the spinach until it is just wilted. 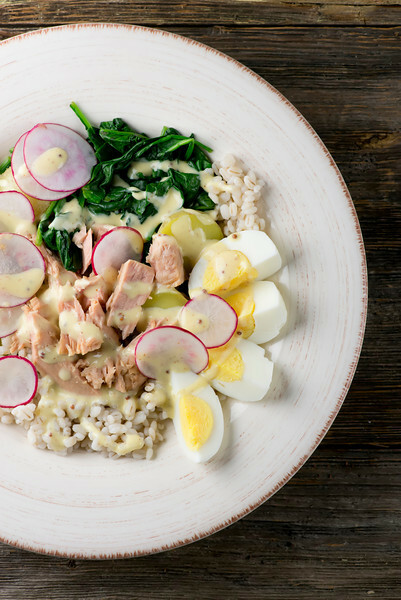 Assemble by filling the bowl or plate with the barley filling one third of the plate, the spinach filling another third, and the potatoes and eggs on another third. Place the tuna in the center. Scatter the sliced radishes on top, and drizzle the whole thing with a little dressing. This looks lovely. With new potatoes, or salad potatoes, I like to boil them, drain, add back to pan and dry off on a low heat, add some butter, toss around, then add ripped watercress, crushed garlic and strong grated cheddar cheese. So basically a warm potato salad with contrasting peppery watercress and pungent garlic.